DEAR DEMOCRATS: STOP FREAKING OUT | "Global Possibilities"
If Democrats want to beat Donald Trump, they need to get past the freakout stage and get to work. In a sane and just world, this presidential race would be a walkover. Commentators would already be sketching out their postmortem analyses of an all-but-certain Hillary Clinton victory. Pare the contest down to its essentials: A former senator and secretary of state, eminently qualified to be president, is running against a dangerous demagogue who has never held public office and should not be allowed anywhere near the White House. Ought to be case closed. But it’s not. 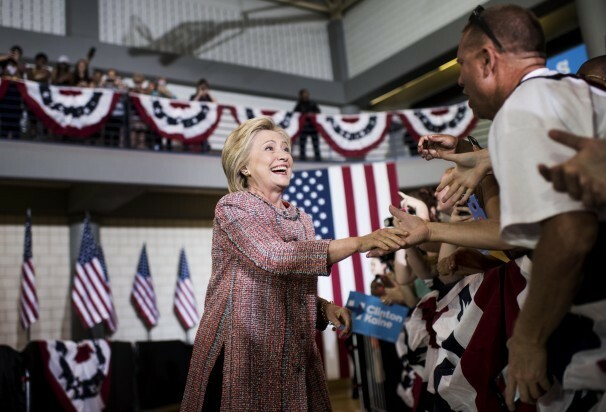 Clinton’s big lead in national polls following the party conventions, which approached double digits, has shrunk to about two points — far too close for comfort. Trump has gained ground in swing-state polls as well. If the election were held tomorrow, Clinton would probably win. But Nov. 8 is many weeks away, and the recent trend line is hardly in her favor. Why has the race tightened? I’ve heard a lot of theories, but I’m not sure I really buy any of them. Trump’s current set of handlers — campaign manager Kellyanne Conway and chief executive Steve Bannon — have done a better job than their predecessors of keeping their candidate from committing acts of self-destruction. They have gotten him to use a teleprompter more, rant and rave less, and sometimes go as long as 48 hours without spewing idiotic vitriol on Twitter. These are no small accomplishments. Conway bravely goes on the cable shows every day and tries to explain the unexplainable. Sometimes she is made into a liar by her own candidate, as happened Wednesday when she denied that Trump would release any medical records on “The Dr. Oz Show,” only to see him do just that a few hours later. Pretty much every time she appears, she has to pretend that one or another of Trump’s nonsensical issue positions makes sense — or, on many issues, that he even has a settled position. But she is unfailingly patient, polite and nonthreatening. Clinton, meanwhile, has been through a rough patch. Just as it seemed she might be getting past the latest hubbub over her emails, she told backers at a fundraiser that half of Trump’s supporters fit into a “basket of deplorables.” Then she felt wobbly at Sunday’s 9/11 commemoration and later disclosed that she has pneumonia. And by the way, I’m well aware that Trump has said worse things about the voting public; there is video of him opining that half of Americans are freeloaders. I’m also aware that in a larger sense there is no real comparison between Clinton’s serious, inclusive, fact-based campaign and Trump’s noxious stew of bigotry, resentment and juvenile fantasy. Voters have been informed of Trump’s ignorant and outrageous statements, his real and potential conflicts of interest, his bankruptcies, his hucksterism, his untempered temperament and all the other factors that make him unthinkable as a president. Coverage by the news media brought all this information to light. Don’t blame the media for the fact that many people say they plan to vote for him anyway. Instead, if you want to stop Trump, focus on the fundamentals — and get busy. Ordinarily, this would be a tough election for any Democratic candidate to win. That is because, historically, a party that controls the White House for two terms in a row has difficulty winning a third. In addition to that headwind, nearly 70 percent of Americans say they believe the country is on the wrong track — an ominous sign for the incumbent party. Trump, with his soaring unpopularity and general flakiness, is no normal candidate. Many voters — including many Republicans — obviously believe that while it may be the GOP’s turn to take the helm, it will never be Trump’s turn. Still, there are those who have real doubts about Trump but may still vote for him because they want change. But the Democratic Party has structural advantages in a presidential year, as Barack Obama so vividly demonstrated. The party’s coalition of women, young people, African Americans, Asian Americans and Hispanics has growing weight in the electorate. Trump’s base — older, whiter, more male — is a shrinking portion of the overall vote. And the electoral map favors Democrats, giving Clinton more paths to victory than Trump. If she wins Florida, it’s over. Same if she wins Ohio. And she could even lose both and still get to 270. Angst doesn’t help. Energizing the Democratic Party’s reliable voters, especially in crucial states, can make all the difference.